Our “Voices from Occoquan” section of the Silent Sentinels and the Night of Terror suite focuses on the words of the suffrage pickets as they recounted their experiences as political prisoners at the Occoquan Workhouse in 1917. Many of these accounts come from Doris Stevens’s memoir Jailed for Freedom, published in 1920. In the memoir, Stevens, a member of the National Woman’s Party, recalls in detail the suffragists’ efforts toward enfranchisement in the final eight years of the suffrage movement. 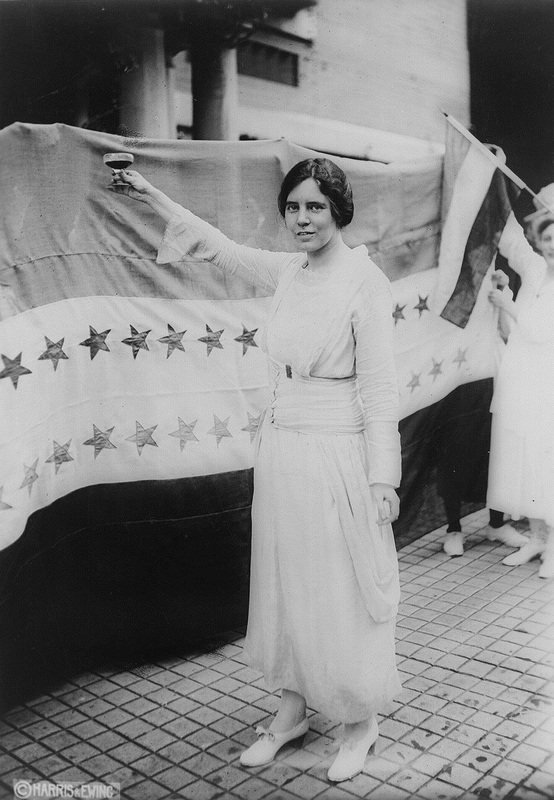 The National Woman’s Party was known as a group of militant suffragists, led by Alice Paul and Lucy Burns, who had been active in the British women’s suffrage campaign. The members of the party who picketed at the gates of the White House were known as Silent Sentinels, allowing the words on their banners to speak for them. They were not violent. They were, however, willing to endure all obstacles to ensure that they were heard. No matter the harassment by crowds or the time served in jail, the Sentinels stood in shifts at the White House gates for nearly two years. Twenty-two hunger-striking, militant suffragists were released yesterday, including Miss Lucy Burns, whom guards described as worth her weight in wild cats; Miss Alice Paul, who can throw a shoe twenty feet and hit a window every time, and Mrs. Lawrence Lewis, whose imitation of a siren has had the attendants dodging imaginary automobiles ever since she went to board at the District’s expense. The high windows that stretched from the first to the third tier were kept open at the top by the request of the women, a request granted after previous skirmishes and window breaking. Most of the pickets were sent to the District Jail, but for the few who were sentenced to Virginia’s Occoquan Workhouse, things were much worse. The circumstances were difficult and foreign to them: food was inedible, conditions were unsanitary, and they were not allowed to communicate with outside counsel. Lucy Burns and Alice Paul were among the first to be sentenced to Occoquan, where Burns distributed a letter regarding the rights of political prisoners, which each of the suffragists signed. With the letter, the suffragists began to argue that their rights as political prisoners were being infringed upon. As political prisoners, Burns argued, they should have access to writing materials and counsel, as well as the ability to wear their own clothing. Prison authorities did not concede to this. Days prior to the events of the Night of Terror on November 14, 1917, Alice Paul had been sentenced to the District Jail in Washington, D.C., where she was force-fed three times a day. When several groups of Silent Sentinels were arrested on the tenth of November and sentenced to Occoquan, Doris Stevens and others felt that it was a conscious move on the part of the Wilson administration to separate the imprisoned National Woman’s Party members from their leader. Even without Paul, Lucy Burns led the suffragists in a hunger strike, which began the moment they reached the Occoquan campus. They demanded to be treated as political prisoners. They refused to pay their fines and they refused to stop picketing the White House gates. They resisted every attempt made by the guards to undermine their cause. Here you will find their own statements. The spirit of their campaign, which did not end until the Nineteenth Amendment was finally ratified in August of 1920, lives on in their words. Alice Paul, toasting to the passage of the Nineteenth Amendment with grape juice, in front of her 36-star ratification flag.